Messina- Known to the Greeks in the 8th century B.C. as Zancle, Messina was already a thriving city in prehistoric times . Occupied in 426 B.C. by the Carthaginians, she formed an alliance with Syracuse but was recaptured by Carthage and destroyed in 396 B.C.. Rebuilt and re-conquered several times, the populous asked Rome for help in 264 B.C., where she prospered until the fall of the Western Roman Empire in 476 A.D.. During the Norman period, Messina became one of the most important cities in Sicily with extensive fortifications and palaces. 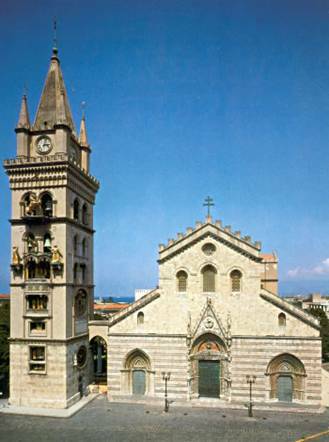 Messina continued to prosper well into the 16th century until the earthquake of 1783 destroyed her. She was slowly rebuilt and destroyed again in 1908 in an earthquake that killed 60,000 people. Today Messina is a modern city and the provincial capitol. Santo Stefano di Camastra - The original town was leveled by a terrible landslide and was rebuilt by the Duke of Camastra in 1682. 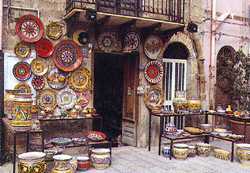 The areas rich clay deposits have made it one of the principal ceramic centers in Sicily. 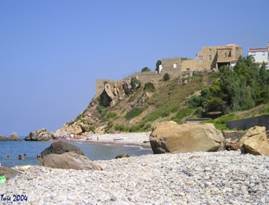 Castel di Tusa - A beach resort near the ruins of a 13th century castle. Nearby are the ruins of Halaesa, a recently discovered Greek city dating from 403 B.C..
Tindari - Founded by Siracusa in 396 B.C., it soon became a Roman city. Of interest is the Greek theater and what remains of the city after a landslide destroyed most of it in the first century. 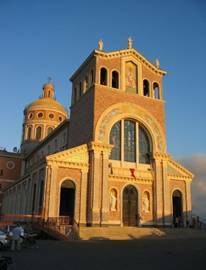 The Sanctuary of the Madonna di Tindari contains the statue of the black Madonna of oriental origin. Taormina - Located on the slopes of Mt Tauro, Taormina is perhaps Sicilyâ€™s most popular tourist Mecca. Founded by Greeks fleeing the destruction of Giardini Naxos in 358 B.C., Taormina continues to delight. 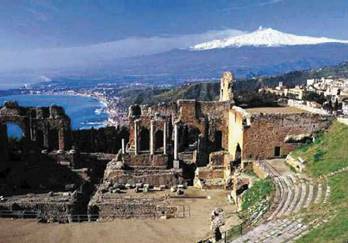 Not to miss is the wonderful Greek theater with breathtaking views of the sea and Mt Etna in the background. Pettineo - A feudal town from the 14th century in the Nebrodi Mountains. The castle, now in ruins, is at the top of the hill. 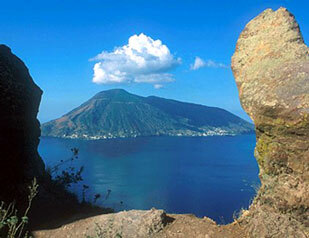 Aeolian Islands - The seven islands that make up the archipelago are volcanic in origin. Vulcano, the island which has given itâ€™s name to all volcanoes, is characterized today by boiling water beaches and hot sulfur springs. A hike to the smoldering crater is not recommended in August. Stromboli, also known as the â€œspittingâ€� volcano is currently erupting. Recommended is an overnight stay, with a trip out to see the volcano by night â€“ either by foot or by boat. Reservations are a must.